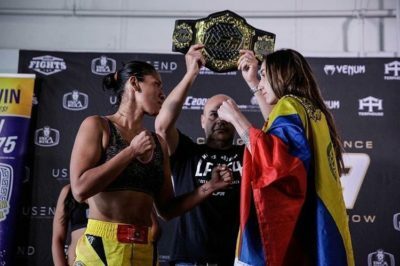 Sabina Mazo was originally set to defend her Legacy Fighting Alliance Flyweight title at LFA 54 against Carol Yariwaki, but Yariwaki missed weight. In what should have been a 3-round non-title fight, it turned into a 5-round sparring session. From the opening bell, Mazo delivered a high output of punches to Yariwaki’s face. With little to no head movement, it was target practice for Mazo. Toward the championship rounds, Mazo would apply more pressure and keep the high output, but never seemed to look for the finish; it was as if she was looking to get the round time in. Yariwaki attempted to close the distance throughout the fight, but Mazo’s footwork and range kept her at bay. Following her successful title defense, Mazo said she’s “looking to get better.” I see Mazo getting more experience in the LFA cage before getting the call up to the UFC.